Schwab has named Heritage Financial Partners its 2017 Best-in-Business IMPACT Award winner. Seen from left to right: Bernie Clark, Executive V.P. and Head of Schwab Advisor Service; Bob Weisse, Chief Investment Officer, Heritage Financial; James Scally, Managing Partner, Heritage Financial; Chuck Bean, CEO & Founder, Heritage Financial; Sammy Azzouz, Managing Partner, Heritage Financial; Ann Smith, COO & CCO, Heritage Financial; Brad Losson, VP and National Managing Director, Relationship Management at Schwab Advisor Services. WESTWOOD, MA--(Marketwired - Nov 16, 2017) - Heritage Financial Services, a personal wealth management firm with 20+ years of experience, announced today that Charles Schwab & Co., Inc. has honored it with the 2017 Best-in-Business IMPACT Award™. Schwab bestows the award annually to a single firm that has been in business for at least 10 years, has a track record of growth and excellence, and uses technology solutions to help expand market reach, responsiveness, and operational efficiencies. Comprehensive wealth management offerings, spanning investment management, cash flow and financial planning, income tax planning, retirement planning, philanthropy and estate planning. Heritage CEO and Founder Chuck Bean and his leadership team accepted the award on the main stage at Schwab IMPACT® 2017, the nation's largest and longest running annual gathering of independent advisors. "We are very excited and proud to have been recognized by Schwab for this honor," said Bean. "For more than 20 years, we've worked extremely hard to build a comprehensive wealth management firm that's the best place for clients who are serious about managing their money. We're known for our meticulous planning approach, expert investment management, and our independence. We are not beholden to a bank or other financial services company so we can put our clients' interests first and act as a true fiduciary." "I'd like to sincerely thank our outstanding staff -- we employ some of the best in the business," Bean continued. "And of course, most importantly, we have our wonderful clients to thank, many of whom have been with Heritage since the firm's founding in 1995." The Schwab IMPACT Awards® are given each year to independent advisor firms that have demonstrated excellence through leadership, innovative business practices, client dedication, and fresh thinking. 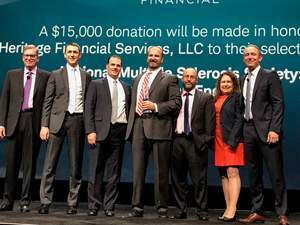 Schwab works with more than 7,500 Registered Investment Advisors (RIAs) in the U.S.
As part of the award, Schwab will make a donation of $15,000 to the National Multiple Sclerosis Society, an organization that Bean holds close to his heart. He is a member of the board of trustees of its New England chapter and co-chairs the Boston Muckfest MS, an annual fund-raising event. Based in the Boston area, Heritage Financial is a personal wealth management firm with 20+ years of experience and $1.3 billion in assets under management. Heritage is the best choice for people who are serious about their finances -- its team provides detailed financial planning and helps clients build smart, cost-effective portfolios. The firm's client retention rate is 99 percent. Services include investment management, cash flow and financial planning, tax planning, retirement planning, philanthropy and estate planning. Visit www.heritagefinancial.net. The Charles Schwab & Co., Inc.'s IMPACT Awards® program recognizes excellence in the business of independent financial advice. Nominees are evaluated and selected by a panel of prominent leaders from both the business world and the financial services industry. For more information on the IMPACT Awards® program, visit http://impact.schwab.com/awards/. Heritage Financial Services, LLC ("Heritage") and its employees are independent of and are not employees or agents of Charles Schwab & Co., Inc. ("Schwab"). Schwab does not prepare, verify or endorse information distributed by Heritage. The Best in Business IMPACT Award™, part of Schwab's IMPACT Awards® program, is not a referral to, endorsement or recommendation of, or testimonial for the advisor with respect to its investment advisory or other services.